Affordable, available and easy to use, Epsom Salt provides the beauty-conscious with a wealth of fun and healthy home remedies and beauty treatments. I first used them in a relaxing bath after reading of their properties and since then have discovered a whole range of things you can use this cheap wonder tub of crystals for! In Grandmas day, Epsom Salt was largely used as a laxative. That's no longer the case,says Jim Hill, a member of the Epsom Salt Council. Epsom Salt, a pure, time-tested mineral compound, is actually Magnesium Sulfate, which absorbs easily through the skin and boasts a whole host of modern-day uses, from beauty to health. Epsom Salt occurs naturally, although most of what we buy in the stores has been manufactured. Even still, the Epsom Salt retains its pure, natural and healing characteristics and has been a long time remedy natural remedy for a number of ailments. 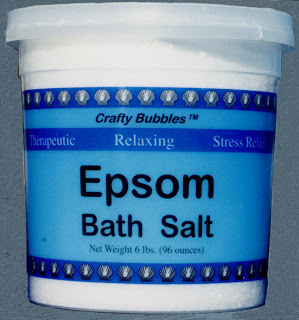 An Epsom salts bath is known to relieve aching limbs, muscle strain and back pain. In addition, they are a natural stress reliever too. Stress drains the body of magnesium. 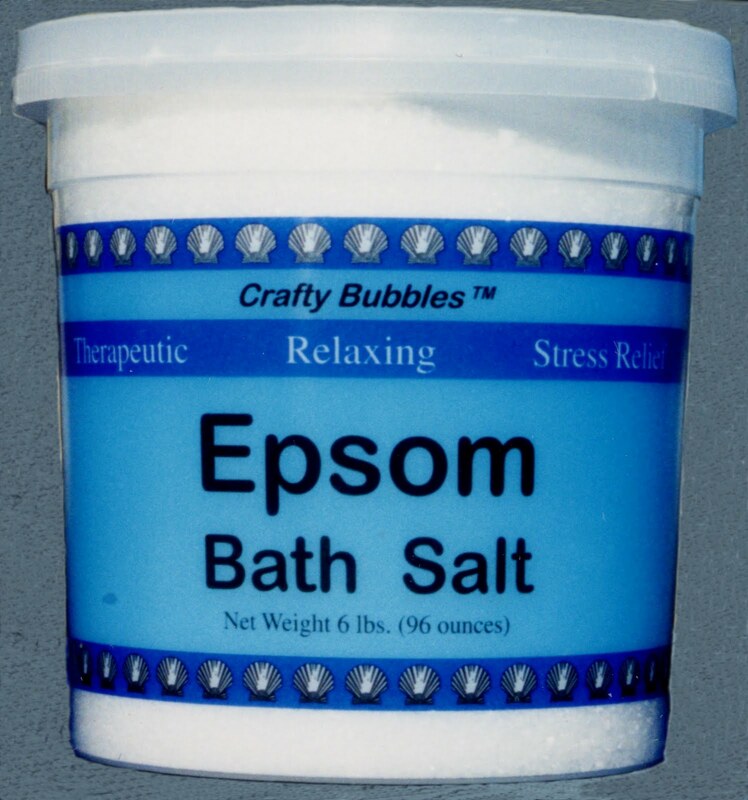 An Epsom salts bath absorbs magnesium into our body thus helping to relieve stress. The magnesium helps to produce adequate amounts of serotonin, a mood-elevating chemical within the brain that creates a feeling of calm and relaxation, it can sedates the nervous system, reduce swelling, relax muscles, and is a natural emollient, exfoliator, and much more. Massage a handful of Epsom Salt mixed with 1-tablespoon bath oil or olive oil and rub all over wet skin to cleanse exfoliate and soften the rough spots! Rinse well. Note recommended on freshly shaved legs. It's the same treatment many upscale spas use, without the upscale price! Mix teaspoon of Epsom Salt into a deep cleansing cream so you can reap the benefits of this mineral deep inside your skin. Massage the mixture onto your skin and then rinse with cool water. Pat dry. Before you go to the trouble of painting your nails, soften your feet by soaking them in a bathtub or plastic basin with warm water and Epsom Salt for at least 10 to 15 minutes. The salt will help to smoothen your feet, giving them a relaxed and refreshed feel. Mix two cups of Epsom Salt with a few drops of a delightful fragrance to create a custom bath crystal. To dress up your bath crystals, add a few drops of food coloring or teaspoon of glycerin. Store the crystals in an airtight container. It will also reduce the swelling of sprains and bruises, so get it in the bath tonight! Run hot water as hot as you can stand it. If you have to boil water to put in the bath (as long as it doesn't burn you) go ahead, and warm it quicker this way. Add about 1 1/2 lb of the Epsom salt to the bath water. Stay in the bath emerged for about 20 minutes. Do not wash with soap this is intended to be a Epsom salt soak. By purging the toxins out of your body you are cleaning it and therefore this will aid in weight loss as well. Soaking in this Epsom salt bath is also very good for your skin and will keep you supple, and can decrease acne breakouts. Remember to drink clear filtered water after sweating, to replenish what has been filtered out of your pores. Otherwise like a sponge you could dry out. Not a good thing! Splinter remover: Soak in epsom salt, it will draw out the splinter! So there you go, just a few of my favourite uses for this stuff, I read a lot about celebs using it for a skinny soak before events and I also found alot of uses for it to feed the plants so really the uses are endless. Another great option to detox and relax are Himalayan bath salts. I got some from Sustainable Sourcing https://secure.sustainablesourcing.com and they smell great and work wonders! !